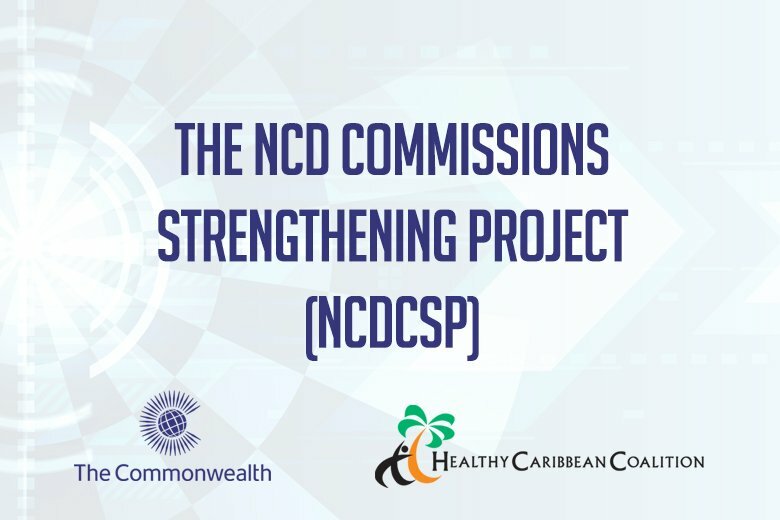 The NCD Commissions Strengthening Project (NCDCSP) is a collaborative effort of the Healthy Caribbean Coalition (HCC) and the Commonwealth Secretariat, working to strengthen the multisectoral response to NCDs in the Caribbean. The goal of the NCD Commissions Strengthening Project (NCDCSP) is to enhance multi-sectoral coordination and action in the Caribbean through National NCD Commissions or similar mechanisms. The strategic aim of the Health Section work of the Commonwealth Secretariat is the strengthening of National Health Frameworks and Policies in the Commonwealth. Thus policies and framework for the prevention of Non Communicable Diseases (NCDs) is one of two major areas of focus in the next three years. National NCD Commissions (NNCDCs) have been identified as the national health structures around which NCD health policies in the Caribbean will be implemented. The Commonwealth Secretariat through this funding, seeks to strengthen these National Health Frameworks with a view to making them more affective and “fit for purpose”. In the Caribbean following the 2007 Heads of Government of CARICOM Summit, regional governments established National NCD Commissions (NNCDCs) as vehicles for multi-sectorality in the national response to NCDs, including health and non-health government ministries and agencies, civil society and the private sector. The NNCDCs were established with specific TOR aimed at providing guidance at the highest levels of government for NCD policy and programming in addition to driving, supporting and coordinating national NCD actions. The 2014 HCC rapid assessment of NNCDCs in CARICOM (a component of the Civil Society Regional Status Report: Responses to NCDs in the Caribbean Community), found that NNCDCs have achieved varying levels of success and have the potential to play significant roles in the NCD response at country level. Against the background of growing global focus on NCDs there has been increasing attention paid to the value of these bodies in achieving truly multisectoral, health-in-all policies responses to the NCD epidemic. In fact, the outcome document of the 2014 UN NCD Review specifically recommended ‘the establishment of a national multisectoral mechanism such as a high-level commission agency or task force for engagement, policy coherence and mutual accountability’. At the core of the HCC, is a commitment to engaging all sectors of society around NCDs and identifying and documenting the most effective mechanisms, such as the NNCDC model, for achieving this objective. Part I: A Civil Society Report on National NCD Commissions in the Caribbean: Towards a More Effective Multisectoral Response to NCDs.